Richard Serra is a New York Minimalist who emerged in the late 1960s and 1970s. 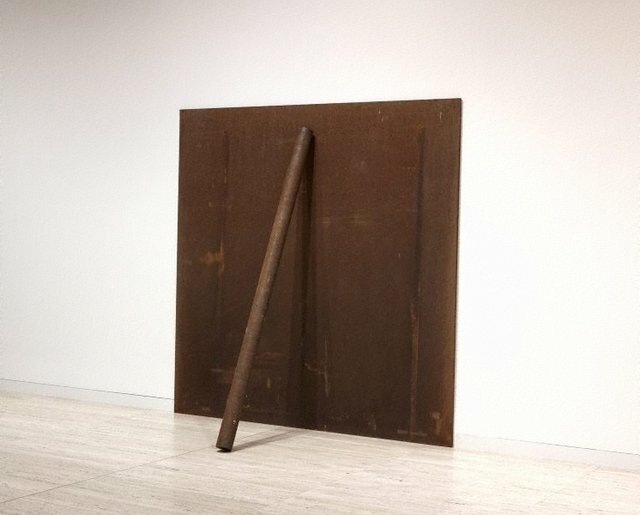 Typical of that movement he uses industrial materials in simple unmodified modules as does Carl Andre. Contrary to the commonly held view that Minimalism is without emotion or feeling it is the physical properties of the object that affect the viewer. The emotion expressed is not that of the artist but that of the viewer encountering the object. The sheer massiveness of the steel that leans heavily against the wall makes us doubly conscious of the effects of gravity. The work incorporates the wall and the floor as essential components heightening the experience of fundamental vertical and horizontal planes and of their interaction with gravity. a - plate; 240 x 240 x 2 cm; diam.